To know if we are effectively reducing emissions, they must first be measured. That’s why we conduct an air emissions inventory at the Port of Vancouver every five years, at the same time as regional and national inventories are conducted. The results identify trends so we can improve our programs and policies, and ultimately reduce emissions. 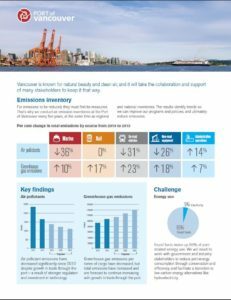 The 2015 emissions inventory for the Port of Vancouver estimates air emissions from marine, rail, on-road, non-road, and administrative activities associated with the port. The 2015 port emissions inventory estimates air emissions from marine, rail, on-road, non-road, and administrative activities associated with the Port of Vancouver. The 2005 and 2010 port emissions inventories focused on land-side operations, to complement inventories prepared by Metro Vancouver for the region, and Environment Canada, for marine activities. Air emissions readily cross regional and national boundaries, which is why we work collaboratively with other major ports and government agencies in the region to address air emissions. We partner with the ports of Seattle and Tacoma and the Northwest Seaport Alliance to reduce port-related air emissions in the shared Georgia Basin-Puget Sound air shed. This shared strategy benefits from active input from Environment and Climate Change Canada, Metro Vancouver, the Puget Sound Clean Air Agency, the Washington State Department of Ecology, and the U.S. Environmental Protection Agency. The strategy includes performance targets for each of the primary port emissions sources, including ocean-going vessels, harbour vessels, cargo-handling equipment, container trucks, locomotives and port administrative operations. The strategy was established in 2007, and updated in 2013. 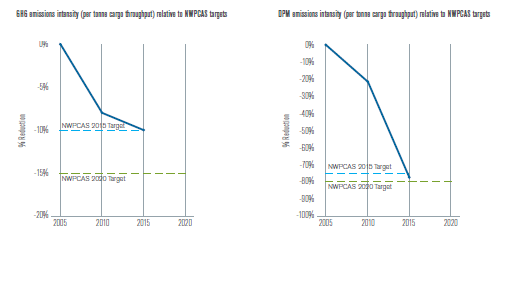 We published our first progress report on the 2013 Northwest Ports Clean Air Strategy objectives in 2014. Implementation reports are published annually. We use our emissions inventory to help us understand the quantity and source of pollutants emitted, but it does not tell us the impact of these pollutants in locations where people live, work and play. For example, pollutants are dispersed by wind and can react with other components to create different pollutants. Ambient air quality monitoring helps us understand the concentration of pollutants in the air at a given location, be it from port or non-port sources. Metro Vancouver’s T39 air quality station, located at Pebble Hill, Tsawwassen, funded by the port authority, has formed part of Metro Vancouver’s ambient air monitoring network since 2010. It is used in both Metro Vancouver’s regional air assessments as well as our own environmental assessments. Tsawwassen First Nation Air Quality Monitoring Program, conducted in 2014 and 2015, included an assessment of air quality on Tsawwassen First Nation lands, compared to Metro Vancouver’s T39 air quality station, as well as the contribution of coal to dustfall. We led this study, with input and support from Tsawwassen First Nation, Metro Vancouver and Westshore Terminals. Burrard Inlet Local Air Quality Area Study Phase II monitoring began along the south shore of Burrard Inlet in 2014. We funded the purchase, installation and a portion of the maintenance for this monitoring, which will be used to better understand the effect of port activities on air quality in Burrard Inlet.